My trip to Sri Lanka was primarily dedicated to tea, but along the way we made a point to explore as many aspects of the local drinks culture as possible. For distilled spirits, that meant coconut arrack, the country’s signature and most popular spirit. To prevent confusion, it’s best to start with what coconut arrack is not. It’s not Batavia arrack, the Indonesian spirit distilled from sugar cane and red rice. It’s also not Mediterranean arak or raki, the anise-flavored liqueur. Though these spirits may share a common etymology, the similarities end there. The tastes and methods of production are completely different, and they’re not substitutes for each other. Sri Lankan coconut arrack is distilled from nectar drawn from coconut flowers, collected by “toddy tappers.” This nectar rapidly ferments into a low-alcohol beverage called toddy. Sadly I did not have an opportunity to try this, but it’s photographed below. The fermented toddy is distilled and aged in barrels of oak or halmilla, an indigenous tree species. After ageing it’s bottled and sold in the ubiquitous “wine shops,” which purvey all kinds of alcoholic beverages. In every example that I encountered, spirits were purchased by walking up to a window display and ordering from a cashier who retrieves the requested bottles and completes the transaction. Even if the alcohol counter was within another store, it was completely cordoned off. I’m guessing this is a legal requirement. Regardless, outside of the airport duty free store I didn’t come across any place where one could freely roam the shelves. As seen above, a lot of the big global brands are here. There’s also a variety of coconut arrack to choose from. The cheapest of these can be had for about three US dollars per 375 ml bottle. At the higher end, I found an offering from Mendis with an eighteen year age statement that sold for about $35 for 700 ml. In total, I sampled about eight different bottlings of coconut arrack, and brought four home with me. One word of advice about buying arrack in Sri Lanka: Read the fine print! One of the bottles I picked up was awful. So awful, in fact, that not even a bus of bartenders would drink it. A glance at the label revealed the reason. Just as there are mixto tequilas that blend agave with neutral spirits, there are coconut arracks that do the same with neutral spirits and distilled toddy. But whereas mixto tequilas require at least 51% of the spirit to come from agave, the percentage of coconut spirits in some arracks is as low as 3%. The ones I tried have nothing but price to recommend them. The pure arracks, though, can be quite nice. They strike me as most comparable to rum, though with a distinctive floral note and brightness. Barrel ageing contributes hints of vanilla and smooths out the spirit. One more word of advice when shopping for alcohol in Sri Lanka: Keep an eye on the sky. Poya, which fall about every thirty days and follow the lunar calendar, are religious holidays. If there’s a full Moon, the sale of alcohol is forbidden. Even in hotel bars catering to tourists, you will be greeted with a sign like the one above. Fortunately our hosts warned us of this the day before, and our bus of thirsty bartenders was well rationed with local beers and arrack. Speaking of beer, the one above was my favorite of the ones I tried in Sri Lanka. Most of the beers sold here are refreshing lagers, but this was a full-bodied stout. Was I man enough to deserve it? Maybe not, but I enjoyed it anyway. By this time in our trip we’d made it well up into the hill country to Nuwara Eliya, once known as “Little England” for its popularity with the British. I understand the appeal. Up here the weather is comfortably temperate compared to the heat and humidity along the coast. It’s no wonder the British moved inland and upward, bringing colonial architecture, a golf course, and billiard rooms with them. Visiting the Grand Hotel is like stepping back in time a hundred years, with wi-fi. And, well, you get the picture. The Grand Hotel is home to one of Dilmah’s T Bars, cafes in which one can order a nearly full range of Dilmah teas. Whether coming down to it for tea in the morning or sitting outside late into the night with a hookah, I loved this place. On our final night here, we each gave a presentation on various ways to incorporate tea into cocktails. For my own, I opted to go with a riff on classic punch technique, which often uses tea instead of water to dilute the strength of the higher proof ingredients. Given how much coconut arrack I was hauling around with me, I wanted to use that too. And, finally, remember not to let good punch go to waste. My first post about Sri Lanka talked about my informal, very quick tour of Colombo. For the rest of my visit with Dilmah and Bols I was on a much tighter schedule, with a ten day trip around the country devoted to tea education, video and photo shoots, various cocktail events, and some amazing excursions. From that point forward we were also joined by a professional photographer and film crew, so these posts will have great images like the one above in addition to my amateur shots. Our began at Dilmah Tea headquarters with a tasting, which took me back to my coffee cupping days. The tasting process for tea is similar to that of coffee, involving examination of the dry leaves, infusion, and lots of really loud slurping. Another parallel to coffee is in the desire to emulate wine. Wine is the template for many other foods and drinks that producers seek to raise from commodity to specialty item. Dilmah follows this path with their Watte (literally “garden”) series of teas. Marketed in direct opposition to commodity blends, these each highlight a different growing region of Sri Lanka. They’re all black teas, grown and processed pretty much identically with the exception of elevation. The difference this makes is striking, as one can tell just by viewing the brewed teas next to each other. Yata Watte (low garden, 1000 feet above sea level) — In the style of Cabernet Sauvignon! Meda Watte (middle garden, 2-3000 feet above sea level) — In the style of a Shiraz! Uda Watte (high garden, 4-5000 feet above sea level) — In the style of a Pinot Noir! Ran Watte (golden gardens, 6500 feet above sea level) — In the style of fine Champagne! This was the most enlightening tasting of the trip, and I recommend it to anyone interested in learning more about tea. With initial classes out of the way, we moved on to the really fun part of the trip: Departing the city and heading into the hills to visit tea estates. While on the road, each of us bartenders was also tasked with filming a short cocktail video. I volunteered to be one of the first, gathering ingredients as we worked our way up and improvising a drink with local ingredients. Our first stop was a roadside fruit stand where I picked up nelli fruit, also known as the Indian gooseberry (not pictured). Tart and fibrous, and tough to eat on their own, these were completely new to me. Locally they’re often prepared by long simmering in sugar syrup to sweeten and soften them, so I figured I would use them that way. Stop number two was our first actual tea estate. Sri Lanka produces much of the world’s true cinnamon and the estate cultivates cinnamon trees interspersed among the tea bushes. Inside we inhaled the heady fragrance of fresh cinnamon bark being shaved and bunched into sticks, then got to try our hands at it ourselves. Below, UK Bols ambassador John Clay gives it a go. Further upward at the estate manager’s bungalow, fellow bartender Simon Toohey and I coaxed this fantastic cinnamon into a lightly tart syrup with sugar and nelli fruits. The final ingredients needed for the cocktail were tea from Dilmah and spirits from Bols. Being in the region, I naturally picked the Yata Watte low grown tea. And while one might have expected me to indulge my love for Bols Yogurt, being outside of the US I seized the opportunity to use the six year old Corenwyn, my one bottle of which I ration carefully at home. Lastly, it was up just a little higher to a spot on the estate with a stunning view. Behind me going down the hill were rows of tea bushes. Rising up in the distance, the Sinharaja Forest Reserve. This is, without a doubt, the most stunning setting in which I’ve been invited to make cocktails. It was not, however, the easiest. We had to contend with fading light, an incoming storm, and, most vexingly, a bakery truck — like an ice cream truck in the US — playing its music somewhere in the rolling hills. Seemingly every time we began a take, the dulcet tune of Fur Elise would come echoing through the pristine setting. Getting around this required clever mic work from the video crew, and whenever it started to rain I was rushed into the van to stay somewhat dry. The set was completely broken down and put up again at least once. Between takes, Bols brand manager Ara Carvallo kept me looking presentable. By the time we got to the final close-up shots, rain was pouring down and we huddled awkwardly with umbrellas to keep things somewhat dry. It’s a testament to the crew that in the actual video everything comes together so smoothly. Here’s the recipe for the Nelli Hot Pot (aka the Rainmaker), on the off chance anyone reading this happens to have Dilmah Tea, Bols Corenwyn, nelli fruit, and real Ceylon cinnamon on hand. Combine ingredients in a tea cup. Veryhair only offer best quality virgin human hair full lace and lace front natural looking wigs for african american black women. Celebrity wigs like kim kardashian hair,long and short bob hair,layered bob wig,u part wigs, lace and silk closure all is free shipping now! Moisten half the rim of a rocks glass with lime juice and coat with the salt and cumin mixture, then fill with ice. Shake cocktail ingredients with ice and strain into the glass. About that curry blend: It’s the roasted curry powder from Rice and Curry: Sri Lankan Home Cooking by Skiz Fernando, Jr., a very interesting cookbook a friend sent me recently. Rather than copy that recipe here, I’d rather encourage you to support the author by buying the book or purchasing his blend directly, which you can do here. It requires a few hard to find ingredients like curry leaves and a dozen spices, so buying the blend is the easier approach. I recommend the book though and have enjoyed the wonderfully flavored curries I’ve made from it. Simmer all ingredients for a few minutes until flavorful, then add a pinch of salt. Cool, strain, and bottle. 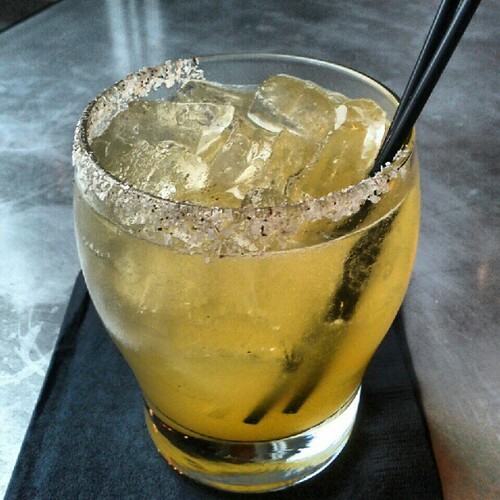 Or save yourself the trouble and come enjoy one at the bar.